Modeled after classic airport signs, this clever coir doormat sends your imagination soaring. Wouldn't it be wonderful if every time you left home you could board a flight to anywhere in the world? Go wherever your heart desires—at least in your mind—with this clever doormat. 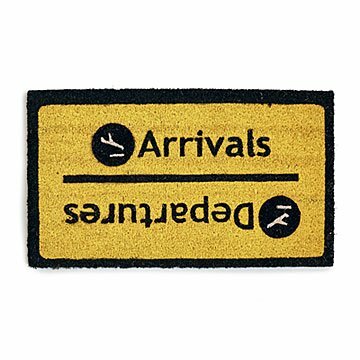 Crafted from sturdy coconut fibers, the vibrant design is modeled after classic airport arrival and departure signs. Give the unique piece to a new home owner or world traveler and give their daily routine a sense of adventure. Hand loomed in India. It's challenging to find cool gifts for grown kids. But yall have helped that dilemma tremendously! And this is a cool gift!